Unlike mammals, birds have no external ears. The outer ears of mammals play an important function in that they help the animal identify sounds coming from different elevations. But birds are also able to perceive whether the source of a sound is above them, below them, or at the same level. 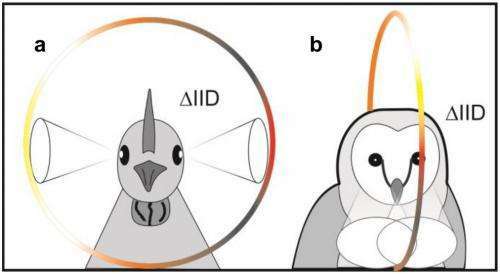 Now a research team from Technische Universität München (TUM) has discovered how birds are able to localize these sounds, namely by utilizing their entire head. Their findings were published recently in the PLOS ONE journal. 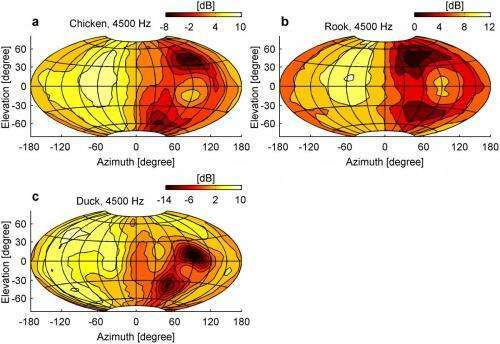 The avian brain determines whether a sound is coming from above or below from the different sound volumes in both ears. "This is how birds identify where exactly a lateral sound is coming from - for example at eye height," continues Schnyder. "The system is highly accurate: at the highest level, birds can identify lateral sounds at an angle of elevation from -30° to +30°." Why have birds developed sound localization on the vertical plane? Most birds have eyes on the sides of their heads, giving them an almost 360° field of vision. Since they have also developed the special ability to process lateral sounds coming from different elevations, they combine information from their senses of hearing and vision to useful effect when it comes to evading predators.